The manganese di-oxide (MnO2) from our line-up comes utilized as a product of excellent industrial utility that comes found across various parameters and industrial backgrounds. 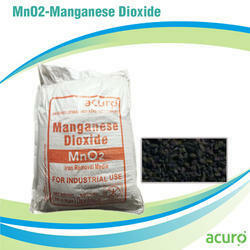 Our manganese dioxide comes to be finding an excellent utility in various procedures pertaining to the elimination of iron, hydrogen sulphide, and manganese from water supplies. The greens and from our line-up comes to be a product of an excellent industrial and commercial utility. Our output comes to be fully capable of curtailing iron, manganese, and hydrogen sulfide from water through procedures of oxidation and filtration. We ensure that soluble iron and manganese comes oxidized and removed through a real contact with various other higher oxides of manganese on the greens and. 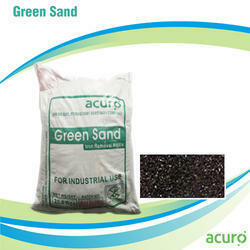 Manganese Greensand is capable of reducing iron, manganese and hydrogen sulfide from water through oxidation and filtration.About Manganese Greensand Iron Reduction Media FiltersManganese Greensand is formulated from a glauconite greensand which is capable of reducing iron, manganese and hydrogen sulfide from water through oxidation and filtration. When the oxidizing capacity power of the Manganese Greensand bed is exhausted, the bed has to be regenerated with a weak potassium permanganate (KMnO4) solution. In order to restore the media, it must be periodically regenerated with potassium permanganate (depending upon oxygen content of water). To facilitate regeneration, optional regenerant systems are available. For efficient application, the pH must be at least 6.8 and temperature should not exceed 120° F. To aid in the oxidation of iron, the chlorine or potassium permanganate may be fed into the water ahead of the iron filter. 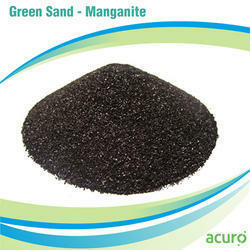 Manganite (greensand) is a black filter medium used for removing soluble iron, manganese and hydrogen sulphide from well water supplies. It also has the capability of removing radium and arsenic. 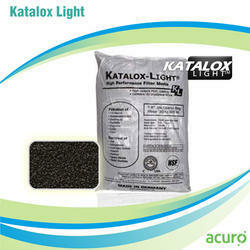 It is processed from the mineral zeolite ( a light weight granular core) with a manganese dioxide coating is deposited on the surface of the mineral grains. Each grain has a finite amount of manganese dioxide coating it. Unlike in-situated media, there is no need for any extensive pre-conditioning of the filter media to try to apply a coating. The filter media is ready to install in the filter and be regenerated. 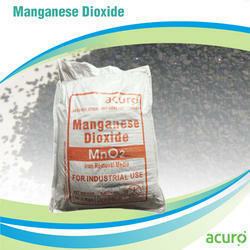 The manganese dioxide coating acts as a catalyst in the oxidation reduction reaction of iron and manganese. The media can be used in two methods of operation: continuous regeneration (cr) and intermittent regeneration (ir). The cr method is recommended for predominantly iron bearing waters with or without the presence of manganese, and the ir method is recommended for use on ground waters in which manganese predominates. 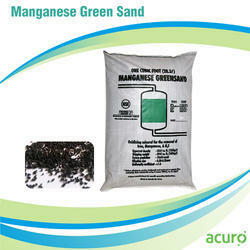 Additionally, manganese greensand is listed under ansi/nsf standard 61 for portable water treatment components. 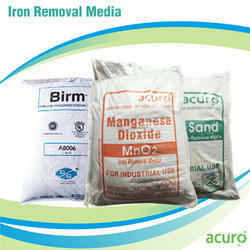 Acuro Organics Limited offers a wide range of Iron Removal Media's. BirmMedia is a black catalytic media used for removing soluble iron, manganese, hydrogen sulfide, arsenic and radium from water supplies. The media has unique characteristics in addition to its catalytic property which facilitates the oxidation reduction reaction of iron and manganese. Birm Media can be used at high operating temperatures and high differential pressures without breakdown of the media and is classified as a “high rate” media where the filters can be run at very high linear velocities with excellent results. Unlike other medias, it does not require extensive pre-conditioning. 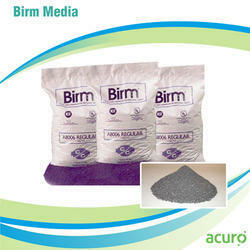 Birm Media effectively removes iron, manganese and hydrogen sulfide from natural waters. 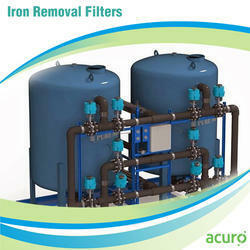 Water for industrial and domestic uses must be substantially iron and manganese free. In many countries it is a requirement that water for municipal use should not contain iron and manganese concentrations of greater than 0.2 and 0.05 ppm respectively, and preferably below0.05 and 0.02 ppm. In certain industries like pulp and paper mills, tanneries, textile plants, dye houses and laundries, it is almost impossible to operate with iron or manganese bearing waters since they would produce objectionable stains, streaks, spots and off-colors on many manufactured products. 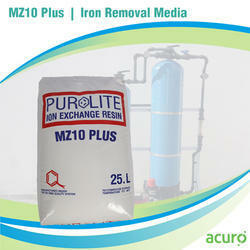 Iron and manganese also foul ion exchange resins. Hence, it is necessary to include a pretreatment stage in most ion exchange processes.